“They were very anxious. They were barking,” a neighbor said. 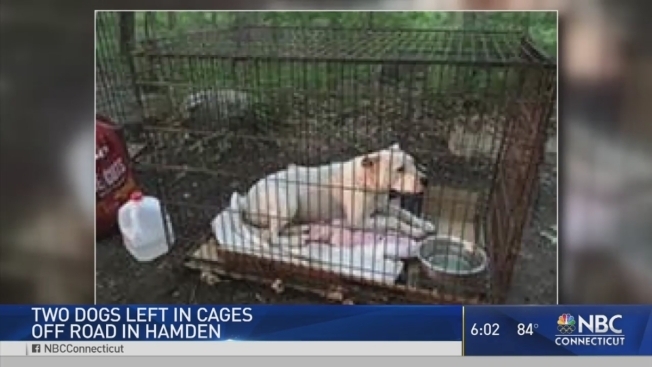 Connecticut police are investigating after two dogs were found abandoned in crates Thursday, according to the Meriden Humane Society. The animals were found in the woods off Mountain Road in Hamden, according to a Humane Society Facebook post. A bag of food and water were also found close to the two crates. Neighbor Janette Berube snapped a photo of the two dogs, believed to be pit bulls or mixes, after they were dumped. She said they appeared to be healthy and weren’t hurt. “They were very anxious. They were barking,” she said. She said her husband saw a White Ford Expedition leaving the area with an empty dog crate on the roof. Officials said they would like to speak to the two dogs' owners. Anyone with information should contact Hamden Police at (203) 230-4000.